A dream effort made by Microsoft to join with Yahoo in order to challenge Google still remains a dream. Lol, Google the giant search engine is untouched in any way you can imagine with the Microsoft-Yahoo deal. This is why we say Google is the best. Let me date you back on the Microsoft-Yahoo deal. Microsoft,2 years ago, decided to pair up with Yahoo to provide a tough challenge to Google in its market value thereby introducing a new search engine named Bing ( A Good catch phrase) in order to attract US based visitors. As we predicted earlier in our site, the effort of Microsoft and Yahoo still remains a low profile as Google is and will be the top search engine. I strongly feel Google cannot be brought down by any other search engines. If you look at the estimates Google produced until December 2010. Google got 67 percentage of US search visitors whereas the Yahoo and Bing combined got near 30%. Can you see the difference!!! Google, i believe, will come up with some key techniques to improve the US search traffic once they dealt with their new mobile launch. What do you think on the new estimates between Google and Yahoo. 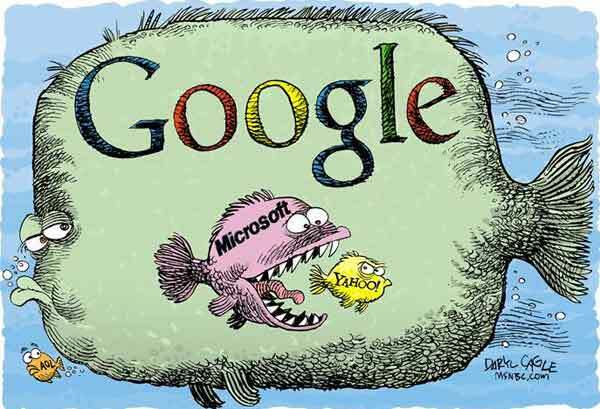 Do you think Google will continue to lead the race or the Microsoft-Yahoo duo can stop them? Share with us with your comments.